It’s difficult to know what’s happening in Syria not only because of the confusing violence but because the Western news media has lost nearly all credibility when it comes to reporting on Muslim countries, at least those on America’s and Israel’s enemies lists. William Blum explained the dilemma at the Anti-Empire Report. The Holy Triumvirate, the United States, NATO, and the European Union, or an approved segment thereof, can usually get what they want. They wanted Saddam Hussein out, and soon he was swinging from a rope. They wanted the Taliban ousted from power in Afghanistan, and, using overwhelming force, that was achieved rather quickly. They wanted Muammar Gaddafi’s rule to come to an end, and before very long he suffered a horrible death. Haiti’s President Jean-Bertrand Aristide was democratically elected, but this black man who didn’t know his place was sent into distant exile by the United States and France in 2004. Iraq and Libya were the two most modern, educated and secular states in the Middle East; now all four of these countries could qualify as failed states. These are some of the examples from the past decade of how the Holy Triumvirate recognizes no higher power and believes, literally, that they can do whatever they want in the world, to whomever they want, for as long as they want, and call it whatever they want, like “humanitarian intervention.” The 19th- and 20th-century colonialist-imperialist mentality is alive and well in the West. 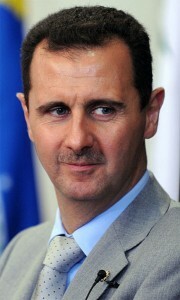 Next on their agenda: the removal of Bashar al-Assad of Syria. As with Gaddafi, the ground is being laid with continual news reports, from CNN to al Jazeera, of Assad’s alleged barbarity, presented as both uncompromising and unprovoked. After months of this media onslaught who can doubt that what’s happening in Syria is yet another of those cherished Arab Spring “popular uprisings” against a “brutal dictator” who must be overthrown? And that the Assad government is overwhelmingly the cause of the violence. Assad actually appears to have a large measure of popularity, not only in Syria, but elsewhere in the Middle East. This includes not just fellow Alawites, but Syria’s two million Christians and no small number of Sunnis. Gaddafi had at least as much support in Libya and elsewhere in Africa. Now, rampant chaos, anarchy, looting and shooting, revenge murders, tribal war, militia war, religious war, civil war, the most awful racism against the black population, loss of their cherished welfare state, and possible dismemberment of the country into several mini-states are the new daily life for the Libyan people. The capital city of Tripoli is “wallowing in four months of uncollected garbage” because the landfill is controlled by a faction that doesn’t want the trash of another faction. [Washington Post, April 1, 2012]. Just imagine what has happened to the country’s infrastructure. As to the current violence in Syria, we must consider the numerous reports of forces providing military support to the Syrian rebels, the UK, France, the U.S., Turkey, Israel, Qatar, the Gulf states, and everyone’s favorite champion of freedom and democracy, Saudi Arabia; with Syria claiming to have captured some 14 French soldiers; plus individual jihadists and mercenaries from Lebanon, Jordan, Iraq, Libya, et al, joining the anti-government forces, their number including al-Qaeda veterans of Iraq and Afghanistan who are likely behind the car bombs in an attempt to create chaos and destabilize the country. This may mark the third time the United States has been on the same side as al-Qaeda, adding to Afghanistan and Libya. Opposition groups including the Syrian National Council, the Free Syrian Army and the London-based Syrian Observatory for Human Rights began disseminating “claims that regime forces besieged Homs and imposed a 72-hour deadline for Syrian defectors to surrender themselves and their weapons or face a potential massacre.” That news made international headlines. Human Rights Watch has reported that both Syrian government security forces and Syria’s armed rebels have committed serious human rights abuses, including kidnappings, torture, and executions. But only the Holy Triumvirate can get away with the sanctions they love to impose. Assad’s wife is now banned from traveling to EU countries and any assets she may have there are frozen. Same for Assad’s mother, sister and sister-in-law, as well as eight of his government ministers. Assad himself received the same treatment last May. [Washington Post, March 24, 2012] Because the Triumvirate can. But according to a U.S. embassy cable, revealed by Wikileaks, since at least 2006 the United States has been funding political opposition groups in Syria as well as the London-based satellite TV channel, Barada TV, run by Syrian exiles, that beams anti-government programming into the country. Regime change in Syria has been on the neo-conservative wish list since at least 2002 when John Bolton, Undersecretary of State under George W. Bush, came up with a project to simultaneously break up Libya and Syria. He called the two states along with Cuba “The Axis Of Evil.” On a FOX News appearance in 2011 Bolton said that the United States should have overthrown the Syrian government right after they overthrew Saddam Hussein. The clinical megalomania of the Holy Triumvirate can scarcely be exaggerated. And never prosecuted. William Blum is the author of Killing Hope: US Military and CIA Interventions Since World War 2; Rogue State: A Guide to the World’s Only Superpower; West-Bloc Dissident: A Cold War Memoir; Freeing the World to Death: Essays on the American Empire. Portions of the books can be read, and signed copies purchased, at www.killinghope.org. This article was originally published in Blum’s Anti-Empire Report. ASSAD+MOSSAD = Death for Syrians and invitation to WW III. Notice how repugnantly wrong Stratfor advice to Assad and the U.S. indicating no massacare when thousands have been massacared in Syria. Again, MOSSAD and ASSAD are destroying Syria for Israel’s agenda, supported by U.S.
Benjamin Franklin: “If you do not expel the Jews from this country, 200 years from now, they will be like vampires, and vampires sustain on other people’s blood”. Case-in-point: U.S. had no enemies in Middle East, until Israel was “created” in 1948. Thank you very much for your interest in Omnik and our solar inverter, we very much appreciate it. I believe our Omniksol-3.0k-TL will meet all your requirement. China Omnik New Energy, with R&D team and managing partners. The truth is the two edged sword. This article is delicious, its great! The Illuminati wants to rule the “world” that they love however not everyone is liking their renditions. Besides, the earth does not belong to just a few people, it belongs to all of mankind. The fruits of their “world” is fouling everything and at some time or the other they will have to come to grips with the loss of their senses. Not quite; Humankind belongs to the Earth, tho’ you wouldn’t know it . . . The old Grey Mare ain’t what it use ti be. Is it? A deadly article. This truth hurts the Qartet. everything is neocons fault! except there isn’t neocon president in US nor in Europe! It’s not about Presidents; it’s about the Criminal Oligarchy.